Welcome to our globally recognized geoheritage parkland within the heart of West Macedonia. Here, you can follow the early steps towards the discovery of plate tectonics, admire the landforms created by the movement of these plates and enjoy their rare biodiversity. We host the oldest rocks of Greece dating to nearly a billion years in age. Our mountains contain the lost Pangaean world of 250 million years ago that split apart to give birth to Africa, Europe, and the ancient Tethyan Ocean. This long geologic evolution produced an envirnment where mammoths and ancient elephants flourished. Our landscape is polishsd to a rare beauty by glaciation that created a highland of rugged mountains, catastrophic canyons and rock formations of strange shapes and mysterious figures. This unique geologic and environmental setting is home to traditional villages where residents maintain time-honored folkways of the Greek countryside. 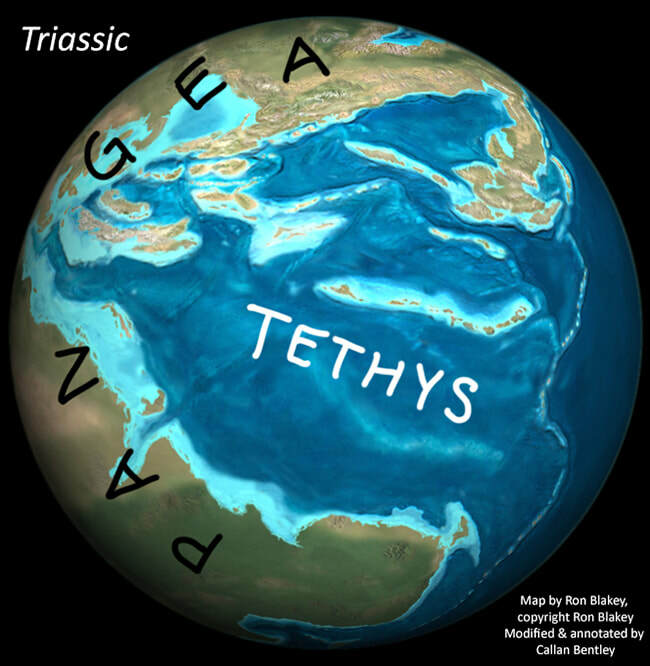 The figurehead of the Geopark is Tethys herself, the Titan of Greek mythology who was mother to all the waters of the Earth. She is namesake to the ancient ocean which gave birth to our unique geological terrain. She gave birth to the Aliakmon River as told by Hesiod himself (~700BC). We invite you to come to know the Land of Tethys, the Geopark Grevena - Kozani, heartland of West Macedonia and the heritage of a billion years of world history. Geopark activities have been held in the area for over forty years: these include international earth science educational projects, regional and international geoscience conferences, and the promoting of geotouristic goals. The present geopark dates to 2014. The Geopark hosts more than 215 Geosites of unique geologic interest, and 18 Geoheritage Web areas where tourists can enjoy hours or days in appreciation of the geo-envornment and cultural legacy of the parkland. An area featuring a distinctive geological heritage and hosting an impressive number of geosites noted for their rarity, scientific and educational value, and arresting beauty. Geopark sites demonstrate various geological phenomena but may also draw interest for their archaeological, ecological, historic and cultural attractions. Over three million foreign visitors annually pass through the Geopark area via the Egnatia Highway, yet fewer than 1,000 of those actually stop for tourism in Grevena or West Macedonia. Geotourism can include visits to national parks, geological formations, scenic areas, and rare or significant geological or geographical environments. Geotourism explores the bridge between the earth and biodiversity and is a means to enjoy nature and wild environments seldom encountered by people, making it the ideal way for any tourist to get to know this region. We can organize a full Geotour trip for you or include a/some geotrails in a trip package in the region of West Macedonia. The tours are guided by certified American geologists which makes sure you will get the best information and guidens possible making your trip a lifetime educational experience! We also provide tours to students and shools who wish to visit the Geopark for educational reason, providing a fully organized trip to Greece including hotel stays, tours, seminars and plenty of activities based on your interests and needs.